A simple agape meal of bread, wine and homemade lentil soup will be served in the parish hall after the celebration of the Holy Eucharist in the church. Jesus' final prayer for the church will be shared from John's gospel. The evening will conclude with the stripping of the altar. Our parish Good Friday service and homily will be offered. The Paschal Candle will be lit and the first celebration of Easter will be celebrated in the church. The choir will sing at both services, and the EYC will host an Easter egg hunt for the children after the 10:15 service. We will also have a cake and punch reception in the courtyard of the memorial garden. We will honor our high school and college graduates and celebrate with a “picnic on the grounds” after our 9:30 service. Feel free to dress casually! Parishioners will gather outside the church before the 10:15 service for the blessing of the palms, followed by a procession into the church and a dramatic reading of the Passion Gospel. Father Tom Seitz will lead a Lenten quiet day in the parish hall, hosted by the Daughters of the King. He will offer guided meditations, based on the autobiography of Saint Teresa of the Child Jesus and the Holy Face, popularly known as “The Little Flower of Jesus”, with the hope and prayer that those who attend will experience their own spiritual blossoming during Lent. 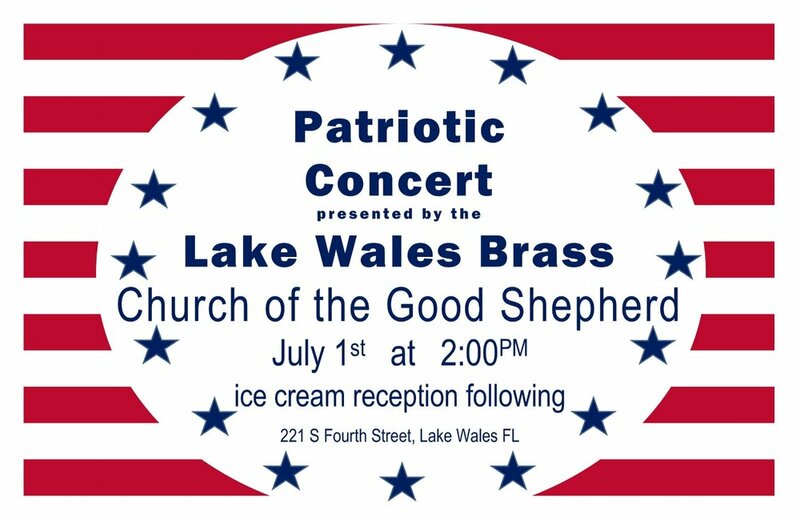 To register, contact Lisa Carter in the church office: (863) 676-8578. The cost of lunch is $10.00. Father Tim Nunez will offer three Ash Wednesday services at 9:00 AM, 12:00 PM, and 5:30 PM. Our EYC youth group will host our annual Shrove Tuesday pancake supper. The cost is $4 for adults and $3 for students. Everyone is welcome to join us! Join us as we celebrate the 50th anniversary of the formation of the Episcopal Diocese of Central Florida. *FEATURED SPEAKER* : The Most Reverend Michael Curry, Presiding Bishop of The Episcopal Church and recent preacher at the Royal Wedding! We are chartering a bus from Good Shepherd to Orlando so that many of our parishioners may attend the Revival. The cost is $15 per person and includes a boxed dinner. The bus will leave our parking lot at 4:00 PM. Please bring your friends and family! Contact Lisa Carter in the church office to register for the bus ride. There will be a Celebration of New Ministry and Institution of The Reverend Timothy C. Nunez as Rector of The Episcopal Church of the Good Shepherd (221 S. Fourth St., Lake Wales, FL) on Sunday, January 27th at 4 o'clock p.m. The Rt. Rev. Gregory O. Brewer, Bishop of the Diocese of Central Florida, will preach and celebrate at the service. Your prayers and presence are requested. Clergy: Red Stoles. Reception will follow. Everyone is welcome. The Brown Bag Bunch will gather in the parish hall to hear our guest speaker, Jennifer D"Hollinder, present a program on the Lake Wales Museum. Please bring your own bagged lunch; coffee and tea will be provided. Everyone is welcome. Please join us for our Christmas Day service in our chapel at 10 AM. Merry Christmas! We will offer two Christmas Eve services at 5:30 PM and 9:00 PM. Nursery care will be provided at the 5:30 PM service. Please join us! The Brown Bag bunch will gather in the parish hall for our annual Christmas party. We will have a pot luck lunch; please bring a dish to pass. The children's choir from Polk Avenue Elementary will be here to sing for us. Everyone is welcome. The Brown Bag Bunch will meet in the parish hall. Parishioner Susan Craig will present a program on "Operation Smile." Susan has been involved with this ministry, which provides cleft lip and palate repair surgeries to children worldwide, for many years. Please bring your own bagged lunch; coffee and tea will be provided. Everyone is welcome. Join us for our fifth annual FallFest! After the Wednesday night dinner at 6 PM, children of all ages are welcome to join us on the playground for games, treats, face painting, and more. Children are welcome to wear costumes. Parents, grandparents and friends are welcome to join in the fun. We are supporting the Lake Wales Care Center's Thanksgiving Food Drive. We will distribute bags and a list of suggested food items for two Sundays beginning October 21st. Bags may be returned any time before November 5th, when they will be picked up by Care Center volunteers. Monetary donations are also appreciated and allow the Care Center to purchase items they need to fill holiday baskets for those in need. Thank you! Parishioners Jo Fuller and Sandy Wolf are planning to host a fall tea. If you are interested in helping, we welcome volunteers to assist them. Camp Wingmann hosts a faith-formation diocesan retreat for middle school students and their friends. Contact Youth Leaders Christopher Maslanka or Julie Stewart to register and apply for scholarship assistance, if needed. Several parishioners will participate in the Kairos Prison Ministry weekend at Avon Park Correctional Institution. Other interested parishioners may get security clearance to attend the closing ceremony on Sunday afternoon. Bring your dog, cat, bird, hamster, horse or other pet to be blessed at a special service. The Daughters of the King will host a reception with treats for both people and animals. We will return to our regular schedule of two services each Sunday morning. Services are at 8:00 AM (Holy Eucharist: Rite One) and 10:15 AM (Holy Eucharist: Rite Two.) Breakfast will be served at 8:45 AM and there will be a social hour with refreshments following the 10:15 AM service. Join us for our annual Rally Sunday service! The 9:30 AM church service will be followed by an opportunity to meet program leaders and volunteer to assist in nearly every area of ministry. Refreshments will be served. Can you help us feed 100+ hardworking teenage campers and their counselors? We are hosting a lunch for the Care Center's Stay-at-Home Work Camp. We can use several volunteers to prepare and serve the meals. There is no cost to you except your time! Please contact Lisa Carter in the church office if you can help. Thank you! On Graduation Sunday, we will honor our high school and college graduates as well as our volunteers. 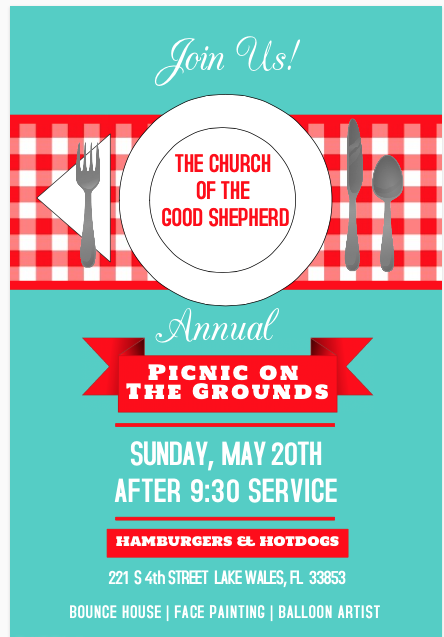 After the service, we will enjoy a complimentary picnic on the grounds across the street under the tent (near the Campbell building.) We will have a bounce house and activities for children. Please feel free to dress casually. We are excited about our 12th annual golf outing to benefit our mission work in Santa Maria, Honduras. The outing will be held at the Lake Wales Country Club; the cost to golf is $75 per person or $280 per foursome. Those wishing to eat dinner only and not golf may join us at 6 PM for a cost of $10. Don't golf, but still want to support the mission? Become a hole sponsor! Hole sponsors start at $100. Please see the flyer, attached below, for details. See you on the golf course! We will offer one Sunday service at 9:30 AM, followed by a farewell reception for Joanie Brawley, who is retiring. Join us for lots of great food and fellowship for all of our parishioners as we bid a fond farewell to Joanie, our Associate Priest of 11 years.